Cody Willoughby | AIM Media Midwest Jim McMaken, treasurer of Awesome Piqua, hands off a $1,000 grant donation to Principal Josh Kauffman on Wednesday at Piqua Central Intermediate. PIQUA — Awesome Piqua, a chapter of the Awesome Foundation, has made their latest $1,000 grant donation to Piqua Central Intermediate School. The grant comes following an application set forth by PCIS instructor Stacy Patton, and will benefit “Diversity Day” at the school on Thursday, April 4. Patton described the entire process from beginning to end as “super fast,” elapsing over the course of about 6-8 weeks. The bulk of the donation will sponsor a visit from the Dayton Contemporary Dance Company, who will visit for a full 45-minute performance with dance stylings from around the world. Students and their families will receive full meals featuring a variety of international cuisine provided by local restaurants and organizations. The Awesome Foundation is a global community made up of autonomous local chapters, who support local projects through micro-grants of $1,000. These grants are provided by the chapter’s trustees and are given on a no-strings-attached basis to groups working hard to make the community a better place. For more information on grant applications, visit www.awesomepiqua.org, or www.awesomefoundation.org. 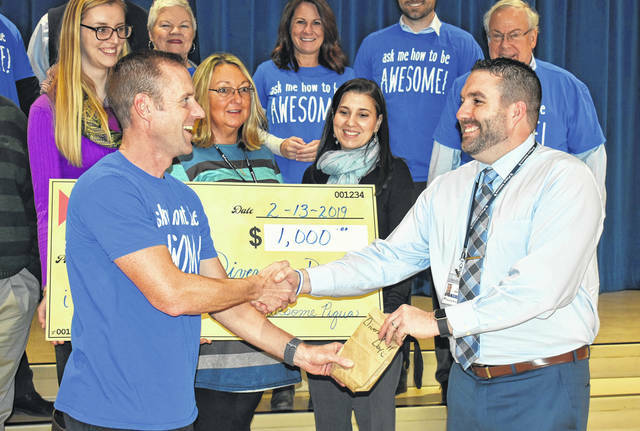 https://www.dailycall.com/wp-content/uploads/sites/30/2019/02/web1_Grant-1-.jpgCody Willoughby | AIM Media Midwest Jim McMaken, treasurer of Awesome Piqua, hands off a $1,000 grant donation to Principal Josh Kauffman on Wednesday at Piqua Central Intermediate.